The head of the International Monetary Fund has warned about the risks to global economic recovery of deflation. 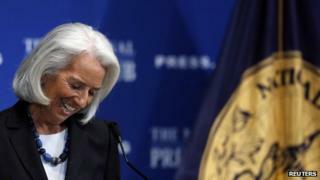 Christine Lagarde said that "optimism is in the air" about growth, but the recovery is still "fragile". "If inflation is the genie, then deflation is the ogre that must be fought decisively," she said in a speech in Washington. Earlier, the World Bank said that the global economy was at a "turning point" but "remained vulnerable". "We see rising risks of deflation, which could prove disastrous for the recovery," Ms Lagarde said at the National Press. There has, for example, been growing debate about whether deflation might take hold in the eurozone, where inflation remains persistently below the European Central Bank's target. Deflation can reduce personal consumption as people wait for prices to fall further, and discourage investment because it can raise the real cost of borrowing. Ms Lagarde also warned about the volatility that could accompany the US Federal Reserve's gradual withdrawal of monetary stimulus. "Overall, the direction is positive, but global growth is still too low, too fragile, and too uneven," she said. Also on Wednesday, the World Bank said in its annual report that richer countries appeared to be "finally turning a corner" after the financial crisis. That is expected to support stronger growth in developing economies. But it warned growth prospects "remained vulnerable" to the impact of the withdrawal of economic stimulus measures in the US. The US Federal Reserve has already begun to wind down its monthly bond-buying programme, previously set at $85bn (£52bn) a month. There is concern this could push up global interest rates, which could affect the flow of money in and out of developing countries and lead to more volatile international financial markets. The World Bank warned that some developing countries "could face crisis risks" if the unwinding of stimulus measures was accompanied by market volatility. The World Bank says that as the Federal Reserve cuts back its efforts to stimulate the US economy it's likely to push up global interest rates which could hit developing economies. A World Bank economist acknowledged in a BBC interview that Brazil, Turkey, India and Indonesia are among the countries that could be vulnerable. However he also noted that the first concrete steps taken by the Federal Reserve to cut back its programme of buying financial assets last month did not severely disturb the markets. "The performance of advanced economies is gaining momentum, and this should support stronger growth in developing countries in the months ahead. Still, to accelerate poverty reduction, developing nations will need to adopt structural reforms that promote job creation, strengthen financial systems, and shore up social safety nets." The bank forecasts that global GDP will grow by 3.2% this year, up from 2.4% in 2013, with much of the pick-up coming from developed economies. Developing nations will grow by 5.3% this year, up from 4.8% in 2013. In an interview with BBC economics correspondent Andrew Walker, World Bank economist Andrew Burns acknowledged that Brazil, Turkey, India and Indonesia were among the countries that could be vulnerable to the impact of US stimulus withdrawal.